I’ve been a loyal customer of Cox Communications for many years. It very much was a rite of passage as I left my parent’s house to my first apartment. For about five years, I’ve enjoyed them for my internet needs. I decided it was time to look into CenturyLink after doing the math on my broadband needs. The service, BillShrink (shut down), opened me up to how much I was really paying for broadband. CenturyLink became quite appealing since it was nearly half the price of Cox. However, price doesn’t always translate to value. 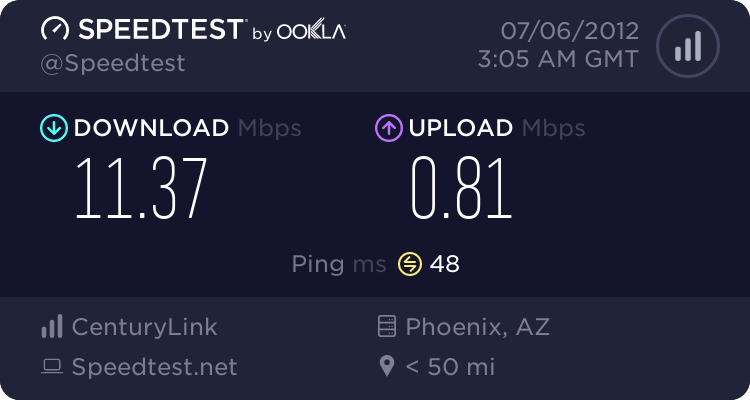 Like any other Arizona Cox user, we experience nightly sluggishness, variable speeds and even disconnects at a once a week basis. Even if the maximum throughput wasn’t the fastest, I wanted reliability. My average bill with Cox Communications was approaching $140 per month, which included digital cable, a rented cable card for my TiVo and “premier” tier of broadband. I became even more annoyed with house ads pushing even more Cox services to me. Every other month, I was given notice to a price increase to keep up with “programming costs.” After a few price increases, enough was enough. I assessed my media consumption habits. I don’t watch much television. Sure, I enjoyed the Speed channel, but I wasn’t going to miss it. Most of the content I consume is available via Netflix or Hulu. I discovered that most of my media is readily available at a much cheaper rate. This is nearly half as much as Cox and it serves me just as well. CenturyLink had a good offer – 12Mb/896k service for $35/month for 12 months. I opted for the contract since it coincided with my lease. It made sense. Also, since I purchased a “naked” DSL line, there aren’t telecom taxes, either. WYSIWYG pricing, I like that. Since I made the switch, my internet connection is stable. It’s quick and is fairly low-latency. Although I wish I could upload faster, I can’t complain much. I’ve noticed that I actually buffer Netflix and Hulu episodes faster than when I was on Cox. I couldn’t believe it! What happens is that Cox’s PowerBoost network shaping feature is fine for basic web surfing, but seems to confuse devices trying to achieve a continuous stream. After digging a little deeper in the modem’s diagnostics, it could train successfully up to 13Mb/1Mb, but 200k is not worth hassling over. I don’t think CenturyLink is for everyone. If uploading video is your thing, you should verify that the upload speeds are sufficient for you. In the real-world, Cox’s upload speeds are superior. I presume that if you qualify for faster speeds, the upload would be sufficient and consistent, too. I’ve been happy since my switch to CenturyLink. I haven’t had any problems since the switch and I’m actually saving money in the process. I’ll share specifics on how to save money without cable in an upcoming post.